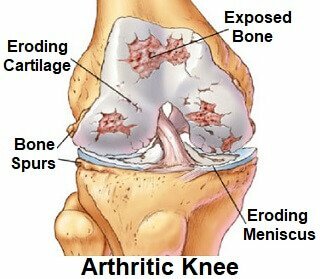 Knee arthritis treatment aims to reduce pain, increase function, stop the progression of the disease, and may abolish arthritis knee pain altogether. There are lots of different options out there. Arthritis occurs when there is "wear and tear" in the cartilage lining the knee joint leading to bone rubbing on bone. This causes pain, stiffness and inflammation. The goal of knee arthritis treatment is to enable you to manage your symptoms so you can get on with your life. By reducing pain and swelling, and improving the strength and mobility of your knee, you can improve your day to day life. It is important to remember that there is no cure for arthritis, the changes in the bone and cartilage cannot be undone. But the effect of those changes can be minimised. Here you will find information on the best knee arthritis treatment options. We will start with general treatments you can do at home, then look at medication and finish with the most common options for surgery. Once upon a time people were told that exercise made arthritis worse. Nothing could be further from the truth. Studies have consistently shown that one of the best knee arthritis treatment options is exercise. Ideally you want a combination of aerobic exercises like swimming and cycling combined with strengthening and movement exercises. If you are a keen runner and suffer from arthritis, it's best to avoid hard running surfaces like pavements. Instead opt for a treadmill, cross trainer, or grass. 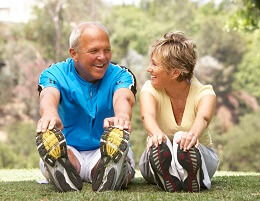 Click on the links above to find arthritis exercise programmes that can help as part of your knee arthritis treatment. 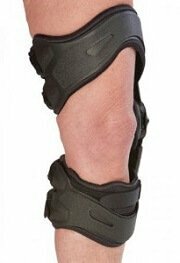 Knee braces can be worn to help stabilise the leg and reduce the pressure going through the joint. They are really good if the knee is feeling weak and wobbly. There are lots of different types of arthritis braces available. The most high-tech knee arthritis braces redistribute forces away from the part of the knee affected by the arthritis, which can dramatically reduce pain. Others provide more general support. In the arthritis knee brace section, you can find out about how different arthritis knee braces work and read user reviews to help you choose the best one for you. Arthritis braces should not be used as the sole treatment but in combination with other knee arthritis treatment options to get the best results. Heat: warmth to an arthritic joint can be very soothing and is a lovely, natural knee arthritis treatment. The heat sensation helps to block out the pain and also helps increase blood flow to the area. This brings in all the chemicals and nutrients that the joint needs whilst at the same time taking away the waste products that can be irritating the joint and contributing to the pain. Ice: ice can be a really useful knee arthritis treatment tool to help reduce pain and swelling. To find out how to safely and effectively use ice, visit the ice treatment section or visit the Ice Wraps section to find out about the best ways to apply ice, such as ice bags, instant ice packs or cryocuffs. Natural remedies are becoming an increasingly popular knee arthritis treatment option. There is more and more research being done into their effectiveness and many people swear by them. Alternative medicine: such as magnets, copper bracelets, creams and gels. You can find out more about these by clicking on the various links. Our joints need movement. The knee joint is surrounded by a bag like structure (known as the joint capsule) which contains fluid which works to lubricate the joint – think of it like the oil in your car which keeps everything moving smoothly. The fluid is pumped into the joint with movement of the knee. However, if the knee remains in one position for too long, the fluid starts to “dry out” and the knee loses some of its lubrication. This is why when you go to get up after sitting down for a while the knee feels stiff and sore, but then loosens up after a few minutes e.g. when watching telly or when you first wake up in the morning. So if possible, try and avoid staying still for long periods. Every twenty minutes or so, do some simple exercises like bending and straightening your leg. Visit the arthritis movement exercises section for more information on this simple knee arthritis treatment tool. There have been a number of studies which show that acupuncture can be a really useful arthritis knee treatment option. It helps to block pain signals and increase the blood flow to the area. I have definitely had success using it with clients myself. However, I personally believe that acupuncture is most useful in the short term to help relieve pain to enable you to do exercises to build up the strength and flexibility of your muscles as the long term solution. It should be used as part of a knee arthritis treatment plan, not on its own. Research has shown us that reducing body weight by 5-10% can considerably reduce arthritis knee pain. It can also improve your ability to carry out exercise. Weight loss is only recommended as part of knee arthritis treatment if you are overweight so always consult your doctor before using weight loss as a knee arthritis treatment option. Find out how much weight you might need to lose with these body mass index charts. There are also certain foods that it is worth avoiding with arthritis as well as some that can help. By making good arthritis food choices, you can help reduce inflammation and pain. Visit the diet for arthritis section to find out more. Sometimes people with knee arthritis find it helpful to use a stick or crutches. Crutches can be used to reduce how much weight is going through the knee when we walk. A stick doesn’t really take any weight off the joint but it does help us to balance. If you are using just one stick or crutch, always use it on the opposite side to where the pain is e.g. if it's your left knee that is sore, hold the stick in your right hand. The reason for this is that when we walk normally we swing our opposite arm with our opposite leg (think of the army marching). This is the most efficient way for our body to move, so we want to mimic that when using a walking aid. These make kneeling much more comfortable by providing a soft cushioned surface to kneel on as well as reducing the pressure through the knee. They also help spread out the force going through the knee, rather than it all going through one point. In the gel knee pads section you can read user reviews and find the best ones for you. Pace your activities through the day – don’t try and do all the strenuous jobs at once. Alternate between physical activities and more gentle ones. Keep using your knee, but rest when it becomes painful. Otherwise you can end up in a boom and bust cycle where when you feel good you do loads but pay for it the next day. Little and often works much better. This is a very simple knee arthritis treatment option, but can be very effective. Wear shoes with low heels and soft cushioned soles. High heeled shoes change the way the forces act on the knee putting increased pressure on the knee joint, so avoid! Cushioned soles will help reduce the forces going through the knee by acting as shock absorbers. Insoles can be helpful if you have problems with your foot arches - having flat feet increases the pressure through the inner side of the knee. Foot position can often be corrected by wearing specially designed insoles in your shoes. Arthritis sufferers often complain of pain when going up and down the stairs. Use the hand rail to take some of the weight off your joints. Doing one step at a time can also reduce the pain - the most comfortable way is to lead with your good leg on the way up, and your bad leg on the way down. This is a really simple knee arthritis treatment but can make a big difference in day to day life. This may be over-the-counter treatment or prescription medications. I know a lot of people don’t like taking pills but they can be really useful. It is generally much better to take pain relief in the short term so that you can do your arthritis exercise programme than it is to battle through pain while your knee gets weaker and more painful. Appropriate medication is one of the most important knee arthritis treatment options available. The ones most commonly used for knee arthritis treatment are Non-Steroidal Anti-Inflammatory Drugs (NSAID). Some are available over the counter e.g. ibuprofen and stronger ones are available on prescription. NSAIDs work by reducing swelling and pain. There are two types of injections that can be used for knee arthritis treatment. These knee arthritis treatment injections are often carried out by your own doctor. Whilst they won't cure your arthritis, they may relieve pain for up to 6 months. SAFETY ADVICE: Remember to always consult your doctor before taking any medication as there are some side effects and contraindications associated with certain drugs. Always discuss any new knee arthritis treatment with your doctor first to make sure it is appropriate for you. Often, conservative knee arthritis treatment is enough to manage the symptoms and progression of arthritis. However, sometimes the pain becomes too debilitating and surgery is advised. The most common surgery performed for arthritis is a joint replacement. If the arthritis is confined to one side of the joint, then a partial knee replacement can be performed. If the arthritis is more widespread, then a total knee replacement is required.